Any benefit to adding sulfur to wheelweight? Wiljen's article claimed that sulfur could be substituted for arsenic, for heat treating antimonial alloys. I've always wondered if there might be some benefit to increasing the arsenic in wheelweight. Supposedly only a trace amount of arsenic is needed, however inquiring minds want to know what would happen if you increased the arsenic? Well, arsenic is expensive and hard to come by but sulfur is cheap and readily available. So let's try adding sulfur and see what happens. So I added 1% sulfur by weight to some of my Super Wheelweight. I didn't really expect all 1% to dissolve into the lead, and it didn't. A lot of it vaporized and burst into flame --- cough, cough, don't try this indoors -- and some of it seemed to react with the lead alloy to form some sort of clumps. I let it stew for a while, stirring from time to time. Then I fluxed, which seemed to dissolve maybe half of the clumps. I wasn't happy with loosing so much lead to fluxing. At any rate, presumably the resulting mix now contains at least a trace amount of sulfur, though we don't know the exact amount. Density = 2723 grains per cubic inch, compared to 2730 gr./c.i. for Super Wheelweight. The difference is probably not significant. A few samples were cast and oven treated at 465F. I'll update this post as the BHN data rolls in. After 1 week -- 35 to 45 (1st sample had irregular indentation, 35 - 42 depending on where you measured, so measured 2nd sample which was consistent 45). Some people don't believe the BHN numbers that I am reporting. Rest assured that I am measuring these samples as accurately as I can. 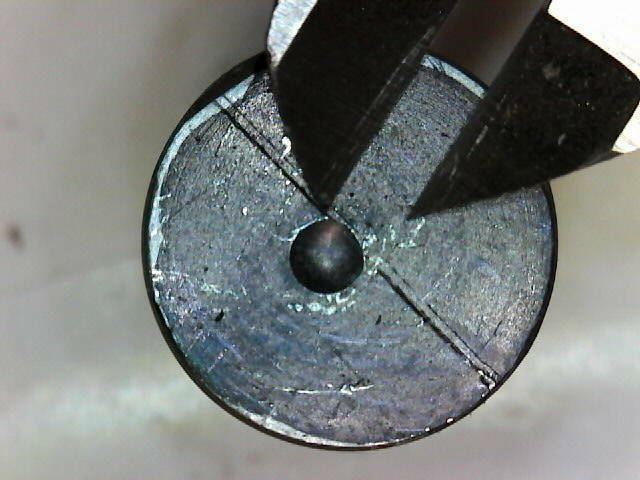 For this sample I broke out the USB microscope to help me see this tiny (0.081") indentation. I measured it multiple times in multiple directions and went with the most conservative measurement. In case you are wondering, I paint the sample with a magic marker because that improves the contrast. Here is the measurement after aging for one month. Using calipers & the USB microscope it measured 0.0825" - 0.084". I also measured by taking a closeup with a DSLR and using GIMP's measuring tool to measure pixels, and came up with 0.083". So call it 41 - 43 BHN. Re: Any benefit to adding sulfur to wheelweight? 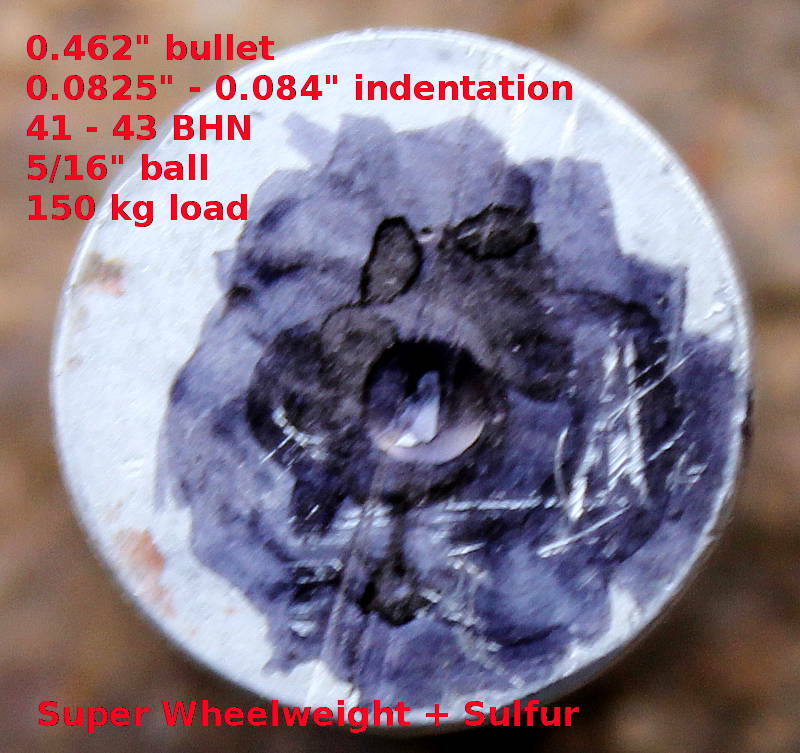 Updated 10/1/17: The sulfur does appear to help, compared to the same "Super Wheel Weight" without sulfur. Since this experiment, I have also tried adding sulfur to reclaimed shot, with mixed results. In any event, I added antimony at the same time that I added sulfur to reclaimed shot, so it was not an apples to apples comparison. It may be that wheelweight does not contain the optimal amount of catalyst, and hence benefits from additional catalyst. But rumor has it that shot contains higher levels of arsenic than wheelweight, so perhaps reclaimed shot already has sufficient catalyst and does not benefit from adding sulfur? Without access to a metals lab to verify the amount of trace elements in my alloy, I can only speculate about these things. 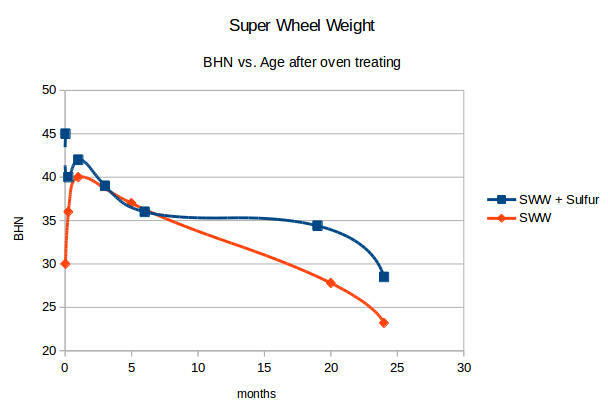 The only thing I am sure about is BHN, and even that tends to be noisy data.